Just as many were getting nostalgic over the loss of Toys 'R' Us, a toy store of yesteryear may be making a comeback. In a message posted on LinkedIn, Strategic Marks founder Ellia Kassoff said his company is planning on bringing back KB Toys, a staple of shopping malls until its closure in 2009. Kassoff said his company purchased KB Toys last year and had been working on a plan to bring back the "Great American Toy Store" and compete against Toys 'R' Us. Last week, Toys 'R' Us filed for bankruptcy and will be closing all of its stores. "With the demise of Toys 'R' Us, this week, we have now accelerated our business plan and hope to have our stores up and running before Christmas," Kassoff posted. He said they are in discussions with many toy manufacturers. "We believe we will have the infrastructure in-place and [hopefully] save the toy industry," Kassoff said. After his initial post, Kassoff gave an update saying he received an overwhelming response. "(We've) received so many calls, emails, and private messages of support as we try to #savethetoyindustry," Kassoff said. Kassoff said his company is looking into why KB Toys initially failed, while also accelerating the plans to bring it back after the fall of Toys 'R' Us. "We understand, we're not just restarting the only other well-known and loved toy chain in the US but hope to find places for those 33,000 jobs which will be lost as Toys 'R' Us closes," Kassoff posted. He is very hopeful about KB Toys' future. "When we're ready, you will be very happy with the results and we believe our model can withstand both online as well as other large competitors for not only the short-term but long-term as well," Kassoff said. Strategic Marks is described as a business that "acquires and develops trademarks in order to rebuild old brands that have left the market years ago but still are highly regarded." Another company under Strategic Marks is Leaf Brands, which makes Hydrox cookies. Last week, Kassoff held a Facebook Live Q&A session on all things Hydrox. In his LinkedIn post, Kassoff said, "Our umbrella, Strategic Marks, LLC has been very successful bringing back many of the most popular products and companies over the last 10 years because we follow a very strict formula: To bring back the experiences we loved as a child, just as you remembered them." According to FundingUniverse.com, KB Toys got its starts in 1922 as Kaufman Brothers candy store in Massachusetts. Decades later, KB Toys became the second largest toy retailer in the U.S. after being bought by Melville Corporation and then the Consolidated Stores Corporation. 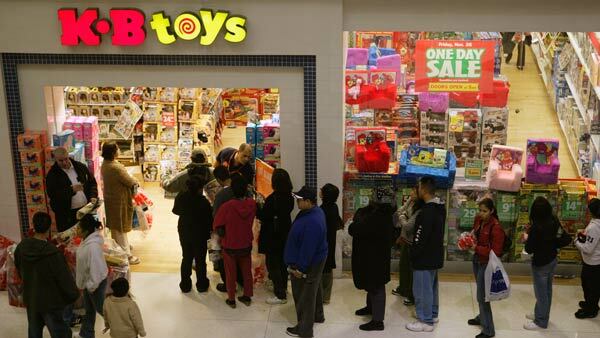 In 2008, KB Toys announced it was going out of business. In 2009, Toys 'R' Us purchased the KB Toys brand including its name and trademarks. Now with Toys 'R' Us shuttering his stores, Kassoff is looking at the return of KB Toys to "save the toy industry." Click here for more stories about Toys 'R' Us.